Last minute shopper? Never fear. All Who Wander has 10 great ideas for every budget. Last year for Father’s Dad I posted a “Hiker Dad’s Wish List”, in the hopes of providing some gift-giving inspiration for wives, family and friends of my fellow trail-loving dads. Well, Christmas is barreling down on us like Jen Davis headed toward Springer. Since, as of this writing, it’s “Black Friday” and I’ve elected not to participate in this particular holiday madness I figured I scratch out an updated list for Christmas 2011. You’ll probably notice that a couple of the items from “Hiker Dad” made it to this list as well. Well, they’re that good! Don’t feel limited by what I’ve suggested; I’d love for you to contribute your ideas as well. Just post your suggestions in the comment section of this blog. Can’t wait to see what you come up with! Love Almond Joy? I do. While browsing at my local outfitter I discovered that Clif Mojo had created their own version of this trifecta of flavors. Toasted coconut, chunks of chocolate and whole roasted almonds. I scooped up a handful and hoofed it to the register. They are so much more crunchy and delicious than their Peter Paul predecessor ever dreamed of being and obviously a much healthier choice. A case might last the winter hiking season! Did you realize Amazon isn’t just about books? They have everything! When All Who Wander became an Amazon affiliate I was shocked to discover the ridiculous range of products from books to music to outdoor gear, to (yes) even kilts, available for online purchase! Try this experiment: Drop by www.allwhowander.us and type something…anything into the search window. You’re gonna be surprised! Did you also realize that by connecting to Amazon.com via the search window or product links at allwhowander.us you help support AWW? Just by doing what you would normally do! My MSR coffee filter has, sadly, been relegated to spending the remainder of it’s days in the Land of Misfit Hiking Toys. The reason? Blame it on the evil Starbucks enterprise. Once I had my first sip of this micro-ground coffee I was sold. I never dreamed so much flavor could come from such a tiny foil sleeve of coffee. I won’t hike without it. A three- pack sells for around 4 bucks. Great stocking stuffer! (And yes, available through our Amazon link!) Sorry, MSR…we did have some good times, though, huh? For Father’s Day I mentioned how much I’d love to find an Olympus Stylus Tough- TG 810 wrapped up in a box in lieu of the Father’s Day standard of necktie, socks or underwear. Well, there’s still a spot underneath the Christmas tree just waiting for said box. The 14 mega-pixel, shock-proof to 6.6 feet, freeze-proof to 16 degrees, waterproof to 33 feet and crush-proof up to 220 lbf is every hiker dad’s answer to the dilemma of balancing weight versus features, quality and endurance. I love the integrated GPS which allows you to “record landmark data in your image and then enjoy the photo surfing feature which lets you see exactly where your photos were taken by using a map display!” This beauty has dropped nearly $50 to $349.99, The good news is that Olympus no longer corners the market and recently several other manufacturers have followed their lead. Still hoping the healthy competition will lead to even better features and more affordability in adventure cameras. The competitors? I thought you’d never ask! Two of the contenders are Fuji’s Finepix XP20 and the Pentax Optio WG-With any of the three I could save my zip-lock bag for tp and trailmix…I’d be happy! On my previous list, the #2 position was held by the Warbonnet Blackbird Hammock (available at www.warbonnetoutdoors.com). I’m thrilled to say that due to the generosity of some amazing friends, not to mention Kenneth Waddy, I am now the proud owner of a Blackbird. If for no other reason, the suspension system places this hammock high on my list of favorites. The only thing missing at this point is a tarp. The one I have my eye on right now is the 4 Season Cat Cut Cuben Fiber Tarp (#4 on the previous list) from www.HammockGear.com. This 8’6″ x 10′ 10″ beauty weighs a ridiculously light 6.5 ounces! Consider that a sil-nylon tarp of the same approximate dimensions weighs 19 ounces; still light but nearly triple the weight of the cuben fiber version. Yes, the price-tag is nearly triple that of the sil-nylon as well but I can tell you from personal experience that Adam (Stormcrow) and Jen’s exceptional craftsmanship and customer service make it worth every penny. How do I know this? I just unpacked my beautiful new Incubator underquilt (#3 on the previous list) and reveled in their exquisite handiwork. They even re-arranged their schedule to get it to me in time for a hike up Cold Mountain. These guys rock! Watch for an upcoming podcast that’ll include a discussion of hammocks, tarps and underquilts with Stormcrow and thru-hiker, Bat at the Hiker Fool’s Bash in Franklin, TN. Great stuff! I love books. I mean real books. Ink and paper. Hardback, paperback, leather-bound…I love books. In fact, a friend of mine sent me the manuscript to a fantastic novel he had recently completed and I struggled to finish it because I had to read it on my lap-top via MS Word. So when another friend suggested I buy an e-reader for hiking because I could “carry a thousand books” I wasn’t even remotely interested….that is until I picked one up. I was shocked at how light it was. In fact, I broke out my digital scale and started weighing my books. It was lighter than 90 percent of what I’d been carrying in my pack. I love simplicity. Hence I love low-tech. The last thing I want is one more piece of technology to maintain but I’ve gotta admit…maybe I need to give E-readers another look. – Lost In Wonder. Rediscovering The Spiritual Art Of Attentiveness. Every time I see this hat in an outfitter, I try it on. 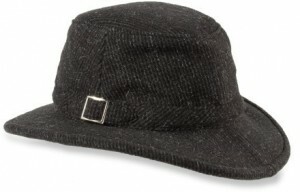 Due to it’s $100 price tag I’ll probably never buy it but I gotta tell you, I love this hat! This handsome wool noggin-topper sports tuck-away ear warmers, is crushable, packable, snow and rain repellent and dry-cleanable. Not to mention it makes me look cool…and let’s be honest…I need all the help I can get. Dana’s pick for the list features: solar power, digital compass, altimeter; barometer; thermometer; tide and moon data, backlight with afterglow, power saving function, water-resistant to 660 feet…oh yeah, and it tells time too! (Need I say more?) Certainly a watch with this toolbox could help even the most navigationally challenged outdoorsman (namely me) get his (or her) bearings. Price tag? About $300. I’m a hammocker and prefer not to sleep on the ground if it can be avoided. However, there’s a 70 mile section of the AT that travels through the Smokies in which it’s “strongly suggested” that you sleep in a shelter. Assuming one day I get to do my thru-hike, I’m gonna need a pad. Choosing a sleeping pad, as with all gear, is a dance between pack-weight and comfort. For comfort? There’s no contest. It’s the Cosmo Nemo with pillow-top. (Yes, I just said “pillow-top.”) Even I could get a good nights sleep on the ground with this luxurious sleep system. And hey, it’s only 70 miles, right? Not buying it? Still too much weight? No problem. Thermarest has a pad for you . The Therma-rest Neo Air packs to the size of your Nalgene and weighs a mere 14 ounces in the regular size. One warning: Buy a set of ear-plugs for your gift recipient. Surprisingly comfortable but crinkly-noisy. – A week-long thru-hike such as the Foothills Trail or the Art Loeb Trail or if you’re nearer to Maine, how ’bout the 100- Mile Wilderness? Christmas for a family in need. Here’s hoping you and yours have a Merry Christmas from all of us at All Who Wander. Great addition to the Guide! Thanks, Bob!